I remember watching a programme on telly, can’t remember what but basically this rather well spoken cove was cruising down the Menai straits off Anglesey dredging for mussels. He pointed out to the cameras that Anglesey is the home of mussels. They are shipped all over the world, everywhere but here in the UK! A year or two later The Flame and I spent New Year in a cottage just off the beach in Red Wharf Bay. I asked our landlord where I could buy Anglesey mussels? He simply said “if you wait a couple of hours, I get mine from those rocks over there”. 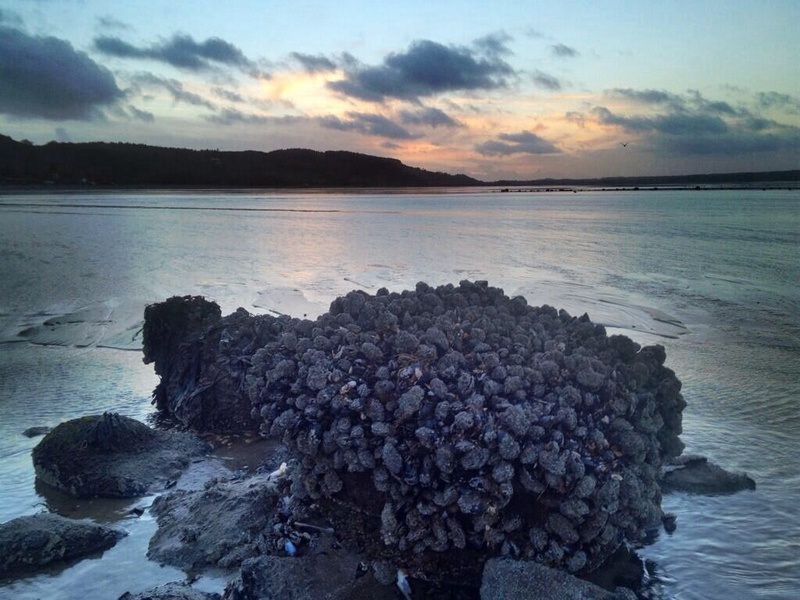 Well that was me sorted, the tide went down and there they where, great clumps of plump, purple mussels clinging gamely to rocks, glistening in the sun. I was in heaven. As it was December the time was ripe to pick. Apparently, you only collect mussels when there is an ‘r’ in the month (i.e. not in May, June, July or August). By picking outside the summer months you give them a chance to breed. It’s also better for us ‘chompers’ because there’s likely to be less bacteria present in cooler waters. As this was a nice beach, it was unlikely that there was many toxins knocking about. Mussels are filter feeders, if they are eating in nasty places, near sewage outlets etc, there’s a chance they’ll be pretty nasty to eat. Pregnant young ladies should avoid eating mussels full stop! I pitched onto the beach with a bucket. I looked out for larger mussels, as these are likely to have had a chance to have their leg over and get some younger ones on the go. After all sustainability is what we should all be about as well! I wouldn’t go for massive mussels as some reckon the meat is not as tasty. I soaked my mussels overnight after scrubbing all the barnacles off with a the back of a knife and ripping off their ‘beards’ (byssus threads). All this after rinsing well. Very important, any that are open after this little prewash I discarded. Of course, once they’re cooked, I discard any that are closed. 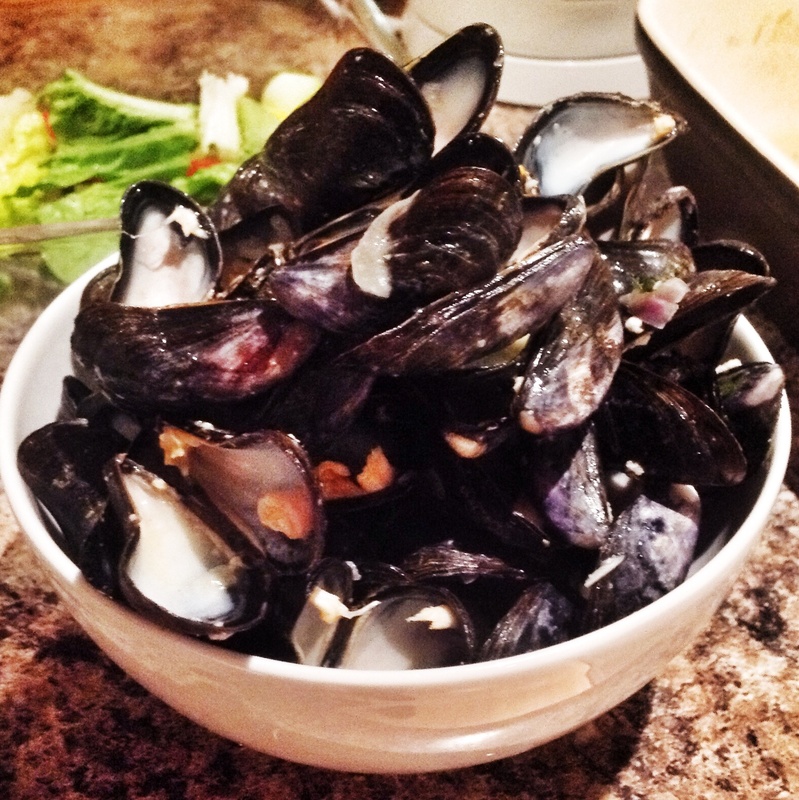 If you do want to purge them, however, to get out grit and sand, place the mussels in a bowl of salted cold water overnight, and they will ‘filter’ themselves clean. There are loads of ways to enjoy mussels. Apparently, you could grill or barbeque them for a delicious smoky flavour, but I always do the traditional French Moules marinières. Here’s the recipe I used. Melt the butter and olive oil in a large saucepan (which has a lid) over a medium heat. Add the onion and soften. 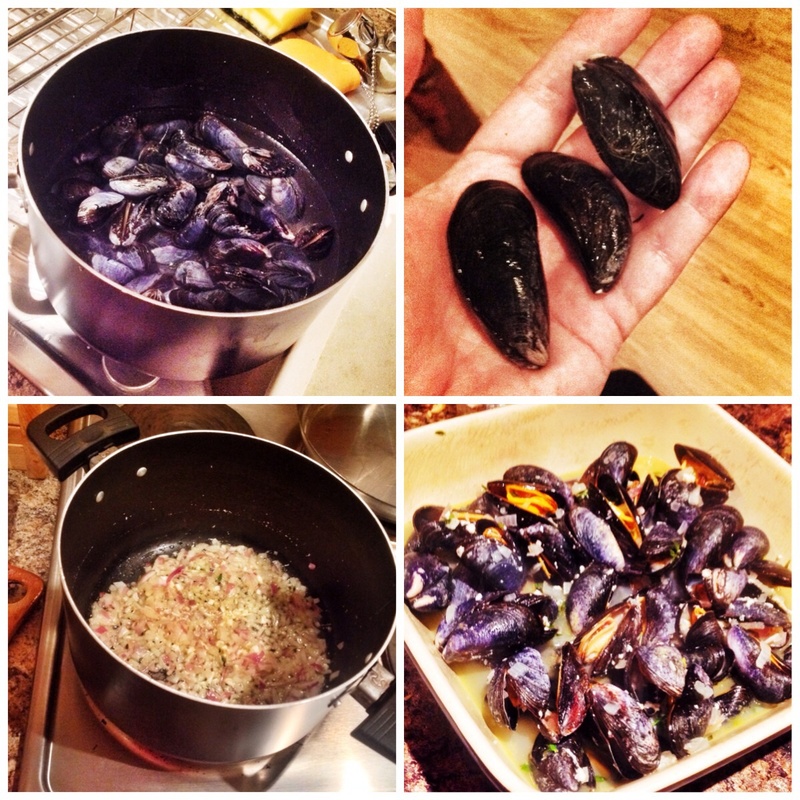 Add the garlic a few minutes later, so you don’t burn it, then the mussels, wine and thyme. Pop the lid on and leave to simmer, keeping an eye on the mussels to see when they start to open. This will take around 10–15 minutes. Remove the lid and taste the juice to see if it needs seasoning or not, then add the cream or crème fraîche, just heating through but not cooking. Remember to discard any mussels which are still closed at the end. I had one when I did it. Pour into a big dish, put in the centre of the table and serve with a crusty baguette for dipping into the white wine and garlic broth that will be left when you’ve plundered the mussels. Give it a go. Obviously take care if you are foraging them. Otherwise just get from your fishmonger or at a pinch your local supermarket!